I have to be honest here, I had never cooked with leeks until I made these quiche last year for the first time. I had eaten leeks (cooked by others or restaurants), but never myself walked into a grocery store and purchased them. Can I just say, if you too are a virgin leek cook, it’s okay. You CAN do this! However, if you absolutely are terrified, and don’t trust me enough, you can substitute onion or green onion. Just use half the amount as they are both more powerful (in my opinion) than leeks. I have another confession. When I first got married I used to tease a friend because she had never seen raw chicken before. During that same time period, when I heard the term “leeks” I thought they were some sort of seafood. Hey, we all have to start somewhere. Kathy…I’m sorry I teased you! Back to the quiche. Last summer I took a trip to Arizona. In July. It was 114 degrees. HOT. It’s funny because the locals all say, “but at least there was no humidity.” True. But it didn’t matter. 114 degrees is hot, even without humidity. 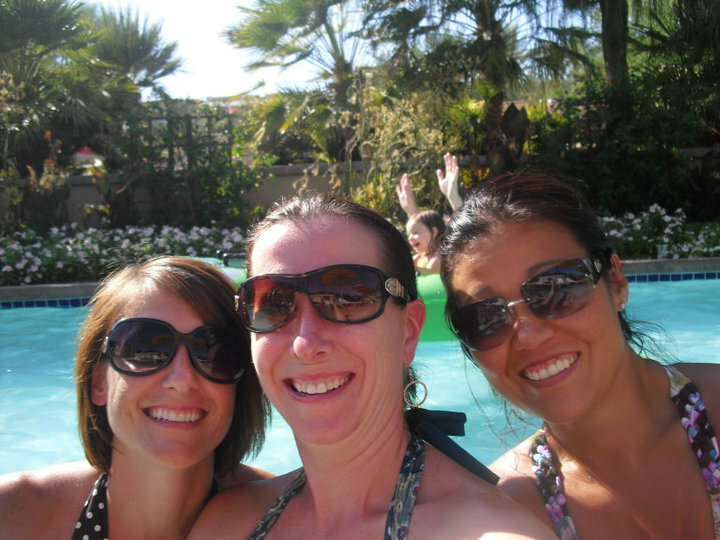 I met up with my besties from high school (Steph in the middle and Jenna on the right). I’m the one in the big fly glasses. (what they aren’t cool???). Steph is one of those people who has a natural talent at buying antiques and making them into something amazing. If you live in Arizona, she is opening up a new shop, Sweet Salvage on 7th Ave (4809 N. 7th Ave, Phoenix, AZ, 85013). Or you can visit her website, www.sweetsalvage.net. Once again, back to the quiche. When talking about besties it’s so easy to get distracted. Steph made this quiche for me and Jenna one morning, and let’s just say it was amazing. I needed the recipe. Immediately. As soon as I got home I bought 12 little 4″cake pans. In addition to the bacon and leek, she also made spinach. Delicious, and the recipe will be below. Here’s the best part. 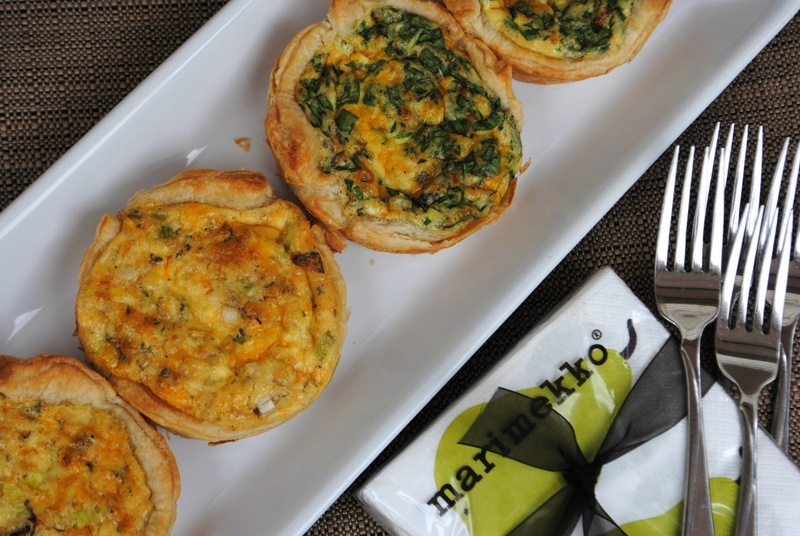 I bake up 3 batches of these individual quiche (a total of 18), then put them in the freezer. When I’m in the mood for something hot (or a kid is), or company comes over to spend the night (or a friend for coffee), I have all of these ready! I just need to simply put them in the oven to heat through. Awesome. Enjoy the recipe! Steph and Jenna, I love you girls! I want to sit in a lazy river for 6 hours again drinking pina coladas. Soon. Allow frozen puff pastry to thaw, according to package directions. This recipe will make 9 individual quiche. One entire box of puff pastry will make 18 quiche, so you can double this recipe if you desire. Once pastry is thawed. roll to twice the size on LIGHTLY floured surface. I have trouble rolling it, but if you pick it up you can stretch it easily! Then cut it into 9 equal squares. Press puff pastry into bottom and up sides of 4" cake pans. Beat eggs and add cream, milk, garlic, pepper, parsley, onion flakes, and cheese. I like to saute my bacon (cut up in tiny pieces before frying) and cook the leeks (cut into tiny pieces) together. Add bacon and leeks to egg mixture. Mix well. Pour into puff pastry. Cook at 375 degrees for about 15-20 minutes. Run knife around edge of pan immediately. Allow to cool 10 minutes in pan, then slide out onto cookie sheet. Eat warm or freeze for later use! For spinach quiche, add 1/4 tsp salt and 1/2 cup diced fresh spinach. Omit bacon and leeks. Prepare the same way. Enjoy! I have to admit I am a virgin when it comes to Leeks! Lol. But Im willing to give them a try : ) Your Quiches look great!! Those look simply delish. Yum! I loved your post and the Bacon and Leek Quiche. It really looks delicious and we would enjoy this recipe. Thanks for sharing with Full Plate Thursday and come back soon! I have never cooked with leeks either. Your quiche looks fabulous! Thanks for linking this up to Fat Camp Friday! Hope to see you next week! These look yummy. I love love love quiche! Aimee, This recipe is a keeper. It is so attractive with such great flavors!!!! Please join me for ON THE MENU MONDAY at StoneGable. This would certainly be a very welcomed and yummy addition. These look amazing, and I’m always looking for things I can freeze! Thanks for sharing! I don’t have 4 inch cake pans. 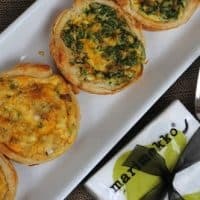 Could I cut puff pastry into 12 and put in muffin cups? or do you have other suggestions? Thanks!